Most awaiting movie Jerseyis in theaters now. Book Now in advance and get 1 one ticket free when you buy 2 tickets. This is valid on all bank credit/debit card. The minimum ticket should be booked is 2 in order to avail the free ticket. Book 2 Kesari movie tickets and pay for one. Payment should be made from BookMyShow MyWallet only. Get Buy 1 Get 1 Free on Selected Bank Cards. BookMyShow will be giving away 1 Free Ticket when you Buy 2 Movie tickets. Get 40% Cashback Using MyWallet. This is valid on all the transactions including Movie Tickets, F&B Orders. The maximum discount you can avail is Rs.60. The Disocunt is valid for Amazon Prime Users Only. Book The latest Tollywood flick "Majili" at BookMyShow and avail buy 1 get 1 free offer. This can be availed by making payments with various bank credit/debit cards like ICICI, Axis, IndusInd, RBL, Citi bank cards, SBI and so on. BookmyShow is giving Buy 1 Get 1 Free Movie Tickets With only selected Axis Bank Burgundy Debit Cards. Valid only for New PayPal user's first ever transaction onPayPal and can be availed once per PayPal user. Please select the quick checkout section for payment via paypal. Book tickets using Union Bank Debit and Credit Cards and Get 20% discount up to Rs.100 on your transaction once in a month. Avail free or discounted tickets over the internet or mobile using WINPIN which are convenient way to present users, employees or partners with free or discounted tickets over the Internet/mobile. This unique 16 digit code is applicable only for the first time use and thus it cannot be redeemed for the next transaction. To redeem the WINPIN, follow the instructions as mentioned on the landing page. Enjoy movie at discounted fare by using WINPIN. Rs.50 OFF on Food Combos and Rs.350 OFF on Non-Movies tickets. Book tickets for movies, events & play using Rupay card and get 1 ticket free when you book for 2 tickets. Please save your Rupay card for QuickPay for faster transaction. Get up to Rs 250 OFF with Equitas Debit cards or Buy 1 Get 1 Free using this card. Book tickets For Movie, Events, Play & Sports and get 20% cashback ( Up to Rs 100 ) and applicable twice per user. Yes Bank Platinum and Titanium Plus cardholders get Rs.100 off on booking movie tickets can be availed twice in a month. Yes First World and Yes First Business World cardholders get 25% twice a month. Maximum discount per month per user is Rs. 250. Grab opportunity on First come First Serve Basis without using any additional promo code. BookMyshow brings an incredible Up to 50% OFF on Entertainment on your DBS Debit Card. Get 50% off on Movie, Concerts & Play tickets booked with your DBS Bank Signature & Infinite Debit Card. Get 35% off on Movie, Concerts & Play tickets booked with your DBS Bank Platinum Debit Card. An eligible cardholder can avail a maximum of 4 tickets per month. Get up to ₹200 off on the price of the second ticket and up to ₹50 off on food combos with IndusInd Signature Legend, Pinnacle & Legacy Credit Card. Minimum 2 tickets need to be booked in a transaction and applicable thrice in a month. Bank of Baroda Mastercard Debit gives Rs.150 off on your 1st transaction and Rs.100 off on your second transaction. Your 2nd transaction has to be within 30 days of first transaction. You can avail the discount on minimum Rs.300 booking. Purchase 2 movie Ticket and Get 1 ticket absolutely free. Yes Bank Private credit cardholder can avail a maximum of 4 tickets in a month. Get flat 50% OFF on event tickets booking. You can get a maximum of Rs.1000 discount per month. Get 2 Movie Tickets Free using IDBI Euphoria cards throughout the week. Book your tickets using HSBC credit cards to get 1 ticket free when you purchase for 2 tickets. Deal is not valid on movies tickets. 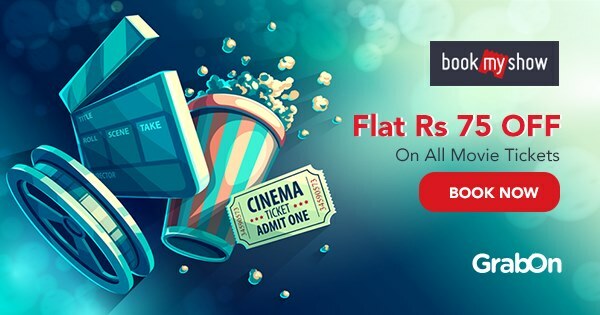 Get Flat Rs.500 on Payment on BookMyShow with RBL Bank Insignia & Club Concierge Card and can be avail on a single ticket also. Make payment with Your IndusInd Bank Legend & Pinnacle Credit card and Get up to Rs.250 OFF. Save up to Rs.200 on movie tickets and Rs.50 on food combos and can be avail 3 times in a month. Book movie tickets on BookMyShow and pay using Selected RBL bank credit card and get 1 Free ticket. Pay using Pockets Visa Card and get flat Rs.100 OFF can be avail once and that's also on Weekends. Bookmyshow in association with Idea Money provides an incredible discount of up to Rs.500 on booking movie tickets. This is valid only for all movie shows. This can be availed only once per user. Get up to Rs.200 discount on movie tickets, Rs.50 off on food combos and Up to Rs.350 off on Non-movies tickets. IndusInd Bank Indulge/Crest/Heritage Credit Cards are applicable to get the discount. Get discounts every month on movie tickets for matinee shows by invitation for Idea Select Postpaid users. This is available on all days of the week but only for the Matinee shows i.e shows upto 12.30 P.M.
A big slice of happiness book tickets using SlicePay and get up to Rs.100 OFF and Get up to Rs.75 OFF when you book next time. Book alteast 2 movie tickets to avail the discount. Book motion picture tickets utilizing ICICI Bank Credit Card and get level Rs.100 off. Just 200+ clients will be fortunate to get the markdown. The Client will be picked concurring to their exchanges history. Tickets will be served on First Come First Serve Basis. Visa blockbuster weekends gives you 50% discount on movie tickets (up to Rs.300) and Rs.200 off on food combos from Thursday to Sunday every week. Book minimum of Rs.1500 and get Rs.400 OFF and valid on Non-Movies ticket booking. Kotak Bank Signature Credit Card gives happy hours to their customers. Now book using Kotak credit cards and get 25% discount on your booking. Book tickets using RBL Credit Card for events and experinaces and get 15% off (Up to Rs.750) on every transaction. Valid only on Sports,Events and plays ticket booking. Pay using Axis bank ASAP card and get Flat Rs.150 discount. There is no limited of transactions per month using this card. You can make 20000 transactions per month using this card. Grab BookMyShow Coupons and Offers Today! Bookmyshow is India's most popular online ticket booking portal. Considered to be one of the best online portals, they sell movie tickets, event tickets, theatre/play tickets and much more! With tickets for every movie or event, you don't need to go anywhere else for your booking. And to top it off, if you are looking for saving on your bookings, with GrabOn, you can avail the best discounts. This page is updated every day. So, now you can get authentic and verified coupons and deals, without any hassle or worry. It was started by three co-founders way back in August 1999 under Bigtree Entertainment. Later, in March 2007, BookMyShow was developed and the rest is history. They went on from being a small online ticket portal to one of the most exclusive ticketing partners for a lot of events. Events like Indian F1 racing, Ed Sheeran concert and many more used BookMyShow as their official ticket booking partner. From PVR to INOX, they have tickets for every major movie theatre as well. Why Should You Book Through BookMyShow? BookMyShow is just not about booking movie shows. They understand that a show can encompass any kind of entertainment. Without restricting yourself, go ahead and check what they offer, that separates them from other portals. Be it events-sports, stand-up comedy, poetry slam or gaming, you can get a ticket. They also have all the latest movie trailers on their website. This way, before booking a ticket, you can see for yourself, if you really want to see that movie. You can also get tickets for plays and concerts. Bryan Adam's India Tour tickets were sold through BookMyShow! Exclusive Movie And Event Tickets On BookMyShow This Christmas And New Year! It is the period of festivity! With Christmas and New Year around the corner, there are a plethora of events that are cropping up. Right from New Year Parties to Christmas events, find information about all the exclusive social events right here on BookMyShow. This time also has a bunch of movie releases and you can find all those tickets at BookMyShow. Which Cities Does BookMyShow Cover? With a massive 4000 screens available in its inventory, BookMyShow is looking to expand into the tier-III cities, aggressively targeting regions in South India. If you happen to reside in one of the tier-II or tier-III city, very soon you will be able to book movie tickets easily. What Are My Payment Options and Offers? If you are wondering where will you find all these BookMyShow Promo Codes, GrabOn should be your only destination! Find all these crazy deals only on this page and save on everything! How many Tickets Can I Book Through BookMyShow? You are allowed to book a maximum of 10 tickets per transaction. Can I Request For A Refund/Cancellation For My Ticket? Unless explicitly stated, once a ticket has been sold it can't be refunded. If the show gets canceled, you may request for a refund. In that case, please contact our customer support. Can I Change My Show Timing Or Change My Seats After Booking My Tickets? Once a ticket has been sold, the show timing/seats can't be changed. Will My M-Ticket or E-ticket Through BookMyShow App or Website Be Accepted? Yes! If you book your tickets through the portal, the cinema will definitely accept it! Why use Bookmyshow coupons from GrabOn? Bookmyshow is undeniably an exclusive movie ticket booking portal. Bookmyshow is the fastest, easiest, and smartest way to book movie tickets online. GrabOn is set to bring a generous range of new exclusive deals. There's something new every time at GrabOn. From exclusive to general Book my show coupons, GrabOn leaves no stone unturned to bring best deals for its users. And if you want your friends and family to experience this magical cinema viewing experience, buy them a BookMyShow Gift Card. Go to GrabOn.in type BookMyShow in the search bar and press enter. Now its easy to book movie tickets online on Bookmyshow.com. Spend your weekends with a movie date with your friends and family. It provides quick and easy movie booking online services. You get a chance to view trailers, info about events & theater, cricket matches, and sports updates and so much more. Get all the latest box office updates from movie reviews, casting, music, genre to the latest movie listings. Not all the online movie promotional service provides you with their exclusive deals right time but we do - help you save money on your movie tickets or events with our exceptional coupons and best buys. Also, avail some great deals like Buy 1 Get 1, 50% OFF, Rs 100 OFF, Rs 200 OFF from leading banks ICICI, CITI Bank, HDFC Bank, SBI Bank, Axis Bank, DBS, IndusInd Bank on both Visa & Master cards and also Freecharge, Amazon Pay, Mobikwik, PayTM, PayUMoney. The services from BookMyShow are available in major Indian cities the likes of Hyderabad, Bengaluru, Mumbai, Pune, Chennai, Ahmedabad, New Delhi among others.